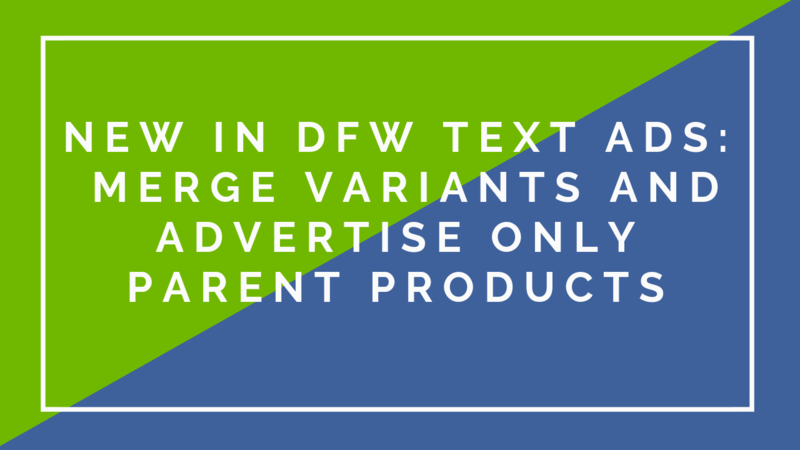 Welcome to a freshly baked new feature for our DFW Feed-Driven Text Ads tool: Variant-Parent Merging. What is DFW Feed-Driven Text Ads? DataFeedWatch Text Ads is a tool that lets you create text ad campaigns automatically on Google Search, based on the data in your DataFeedWatch Feed. Every single product has its own unique keywords and text ads. That does miracles for your CTR! DataFeedWatch Text Ads allows you to better target your potential customers by identifying and creating unique product group campaigns based on your Product Titles. If you sell apparel or any products with variants, all the products have information like Size or Color mentioned in the Titles. Which is great for Google Shopping. However, with DFW Text Ads we use the Product Title to generate keywords. Having information like Size or Color makes the title very long, and long tail keywords may not have enough search volume or even not be eligible at all. That is why for your Text Ads Campaigns we advise you to advertise parent products only. The newly released functionality will enable you to do precisely that. 2. Better Text Ads performance. Instead of having 10 variants that are not eligible, you will have 1 parent with enough search volume, which means more traffic & more transactions. 3. Improved CTRs and Landing Page conversion rates. All products with unique titles will be the part of Product Campaign and the ads generated through this campaign will lead the customer straight to the product page. All products with common titles will be part of Group Campaign and the text ads generated through this campaign will lead the customer to a landing page with all the products sharing the common title. Merging Variants with Parents is a straightforward process. You only need a couple of minutes to reap the benefits of merging in the long run. 1. Go to Edit feed In your Text Ad feed and you’ll see a new Tab in your Text Ads feed mapping: Merge Variants. 2. Select Merge variants into one product and click on go back to mapping. 3. Map the filed item_group_id. Click Save And Proceed and you will be taken to Merge Variants tab again. 4. Here you can choose how would you like the merging to happen. If you click on Predefined Fields you will see that we have already selected the best merging strategy for your feed. 5. You can still go ahead and make changes by selecting different options for every field. Don’t forget to do the same for Custom Fields in case you have any, then click Save and Finish. More on Text Ads. 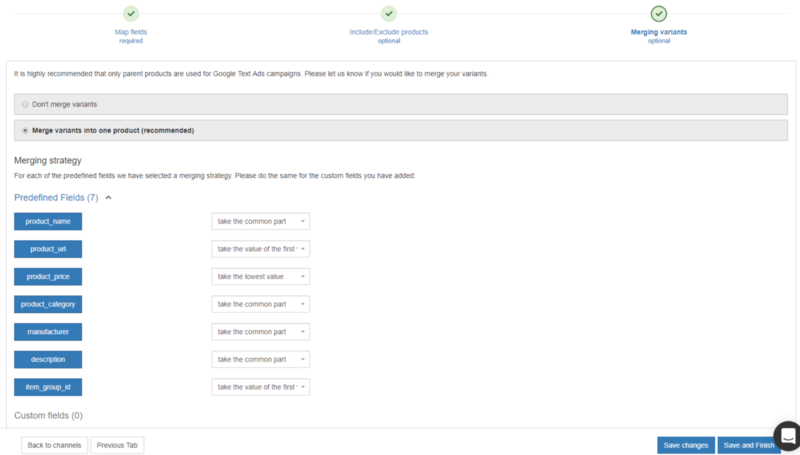 You can find more info about Merging Variants on our Text Ad help page here. If you want to get the most out of your Text Ads campaigns Merging variants into Parent products is a step we recommend you to take seriously. If you are not using DFW Text Ads yet, you should know that there is no trade-off between focusing on either shopping or search. Both PLAs and search text ads can be shown at the same time. Go out and kick off your Text Ads campaign with this small but potent new feature!